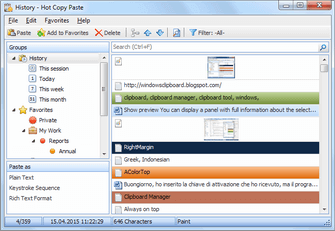 Free Clipboard Viewer is a program used to view the information that is stored in memory when you use copy and cut functions of Windows operating system. A clipboard viewer displays the current content of the clipboard. Most applications for Windows support cutting or copying data to the Windows Clipboard and pasting data from the clipboard. The clipboard data formats vary among applications. The clipboard viewer is just a handy way to know what's on your clipboard at different times. The clipboard temporarily stores whatever you've cut or copied. As soon as you cut or copy something else, the clipboard's contents change. Free Clipboard Viewer allows you to save a clipboard data to a file and load a clipboard data from a file. So you can transfer clipboard contents between computers. The program also allows you to clear the clipboard and redeem the memory occupied by the large object. To clear the contents, click the "Delete" button in the clipboard viewer toolbar. An application can place more than one object on the clipboard, each representing the same information in a different clipboard format. 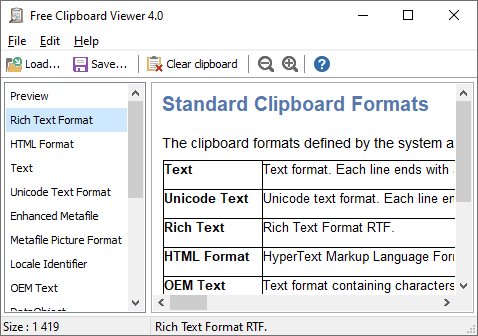 Free Clipboard Viewer lists the available formats for any data that is currently stored on the clipboard. It automatically updates the information displayed as the contents of the clipboard change. For any format you can also view the clipboard contents, size and description. Free Clipboard Viewer is a totally portable application, meaning that you can put it on any USB stick and run it directly from there. In this way, your clipboard viewer and manager will always be with you. You may need more functionality than the clipboard viewer provides. In either case there is a variety of software solutions available for download to meet your needs. The freeware solutions available are sufficient for most people's needs. However, there are some more advanced, purchase only, options available as well. Hot Copy Paste is a highly advanced extension of Windows clipboard. While the Windows clipboard holds only the last item copied, the advanced clipboard can hold up to thousand different entries. Having a problem with Free Clipboard Viewer? Want to ask a question? Or maybe you have an idea for a great new feature? Enhances Windows Clipboard with multiple snippets, secure storage, full-text search, and hotkey access to frequently used snippets.